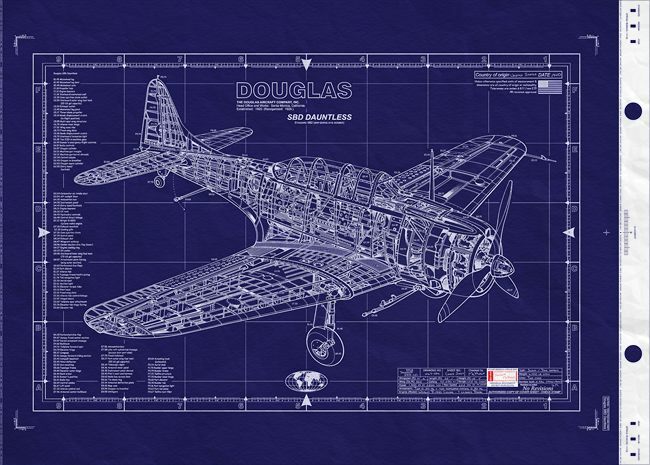 Douglas created a wide variety of aircraft for the US, the Navy in particular. Douglas initially built torpedo bombers and observation aircraft for the US Navy. Founded in 1921 and later merged with McDonnell Aircraft in 1967 to form McDonnell Douglas. 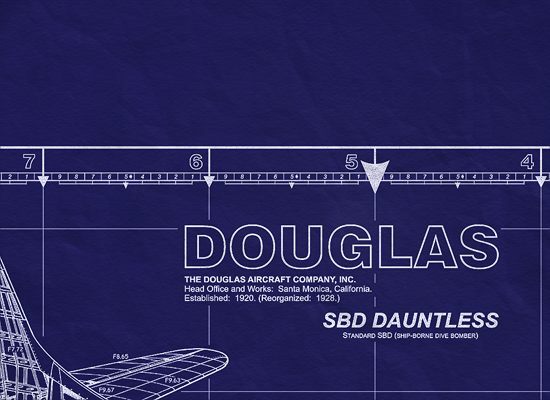 Douglas Aircraft Company largely operated as a division of McDonnell Douglas after the merger. — featured "Swiss cheese" flaps -- dive brakes punched with 3-inch holes. These perforations reduced buffet on a dive and improved the braking effect -- so that it could achieve pinpoint accuracy. The Douglas SBD Dauntless was the Navy's most advanced dive bomber at the outbreak of WWII and is credited with winning the Battle of Midway… thus turning the tide of the war. Continued from above… from the carriers Lexington and Yorktown carried out a series of attacks against the Japanese. In May 1 942, during the Battle of the Coral Sea, SBDs joined with TBD Devastator torpedo aircraft to sink the Japanese carrier Shoho and damage the carrier Shokaku. In June 1942, during the Battle of Midway, the two aircraft types again attacked the Japanese fleet, and it was the SBDs from the carriers Enterprise, Hornet and Yorktown that sunk the Japanese carriers Akogi, Kaga, and Soryu, and damaged the Hiryu so badly that she had to be sunk by her own forces. This victory effectively turned the tide of the Pacific war. Pearl Harbor, Coral Sea. Midway, Guadalcanal, the Marianas and the Philippines - All were milestones in the combat career of the Douglas SBD Dauntless, arguably the most important naval strike aircraft of all time. No other carrier-based attack airplane has exerted such a far-ranging effect on world history. At Midway alone, three SBD squadrons reversed the course of the Pacific War, whilst the Dauntless's contribution both before and after this pivotal action added greater luster to the name. SBD; in official Navy terminology these letters stand for Scout-Bomber, Douglas, denoting both the aircraft's type and its builder. But during World War II, the words Slow But Deadly were more often associated with the designation for the Dauntless scout and dive bomber. Already considered obsolete by the Navy when Pearl Harbor was attacked, the Dauntless remained in action throughout the war, in part because of problems encountered with its replacement, the Curtiss SB2C Helldiver. But even after the Helldiver replaced the Dauntless in front line squadrons, it did not replace it in the hearts of its crews. The Dauntless, although slow and lacking sufficient defensive armament, was loved by the men who flew and serviced it. By comparison, the Helldiver was nicknamed the "Beast" and continued to have problems throughout its operational career. At least 14 Dauntless airframes are in advanced stages of production at Douglas' El Segundo, California production line in early 1941. The five nearest airframes are SBD-2s, followed by three SBD-3s, then six more SBD-2s in the rear. 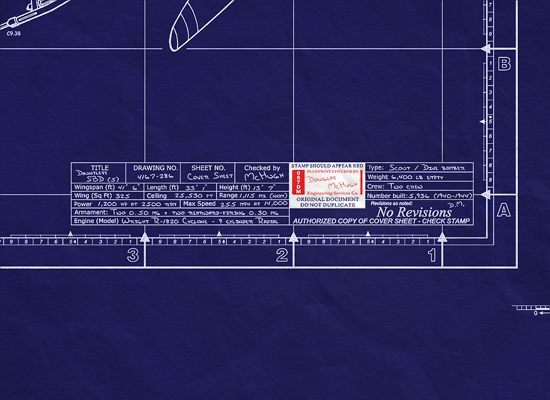 Signs taped to the vertical stabilizers indicate the SBD variant, its Navy Bureau Number (BuNo), and its Douglas construction number. Double rows of rivets secure many of the SBD's panels to the framing. This sturdy construction resulted in a robust aircraft that absorbed heavy battle damage, yet was able to bring its crew back to its carrier or shore base. It was the Battle of Midway on 4-7 June 1942 that will forever cement the Dauntless into United States military history. During this battle, two squadrons of SBDs from the carriers USS ENTERPRISE (CV-6) and USS YORKTOWN (CV-5) turned the tide of the Pacific War by destroying four Imperial Japanese Navy fleet carriers. While the Navy was the largest SBD operator, it must be remembered that the Marine Corps also flew the Dauntless during the island-hopping campaign in the Pacific. Additionally, the US Army Air Forces also flew them, under the designation of A-24 Banshee. While the Army never did fully embrace dive-bombing as an effective tactic, they did fly them in combat: however. the type was primarily used in the utility role. Interestingly, the last of the type were US Air Force F-24 Banshees, with at least one in the inventory as late as June of 1950. The SBD's speed brakes at full extension, with dive flaps on top and landing flaps on the bottom. The tennis ball sized holes allowed the slipstream to pass through the flaps without losing air flow over the tail surfaces, especially the elevators, thus facilitating dive recovery. 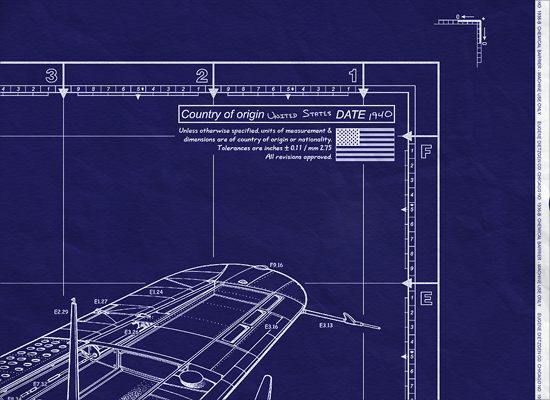 Redesignated the SBD following Douglas' purchase of Northrop, the Dauntless was selected by the US Navy and Marine Corps to replace their existing dive bomber fleets. Fulfilling the attack role assigned to it at its conception, the SBD, operating from the decks of the carriers Lexington, Yorktown, Wasp, and Enterprise, mortally damaged the main units of the Japanese carrier fleet and set the stage for the ultimate Allied victory in the Pacific theatre. The Douglas SBD Dauntless scout/dive-bomber was an evolutionary, not a revolutionary aircraft design. Its design roots stemmed back to a pair of 1934 Northrop designs: the US Army's A-17 and the US Navy's BT-1. One just has to look at the wing design to note the obvious similarities. For the most part, it was the SBD-3 that gained the glory and achieved the most spectacular successes at Coral Sea, Midway, and the Eastern Solomon's during 1942. A total of 584 -3s were delivered to the Navy and Marines, and these had better armor protection and self-sealing fuel tanks. Early production SBD-3s had the single ,30-caliber flexible gun in the rear cockpit, but later examples had twin guns and a large single ammunition box as well. This not only doubled the amount of firepower for the rear cockpit, it also eliminated the need to change ammunition boxes in the heat of combat. The twin flexible gun mount and the large ammunition box was also retrofitted in the field to earlier -3s beginning in mid-1942, and these were in place in most, if not all, SBD-3s that fought in the Battle of Midway. With its increased firepower and nimble handling qualities, the SBD-3 and subsequent variants held their own against Japanese aircraft. They were even used as inner combat air patrol aircraft, a job usually assigned to fighters, and they scored impressive results against enemy aircraft that were attacking American ships. The Dauntless was an all-metal monoplane with low-mounted wings, a single radial engine, and a retractable main landing gear. But it shared these design features with many other military aircraft of its day including the SNJ trainer and the F6F Hellcat. Indeed, there was nothing uniquely outstanding about its design, however its simple but proven features and its rugged construction combined to make it an effective combat aircraft when it was most needed. Pilots reported that it had very similar flying characteristics to the SNJ, and because of their nimble handling qualities. The Dauntless often flew combat air patrol missions where they more than held their own against Japanese carrier-based aircraft. In just a few moments at the Battle of Midway in June 1942, the formidable SBDs swept out of the sunlit sky to break the back of the Imperial Japanese Navy, sinking four aircraft carriers and ending Japanese hopes of victory in WWII. The typical SBD load-out for a scouting mission was a 500-lb general-purpose bomb under the centerline rack. The larger size and heavier weight of a 1000-pounder penalized the aircraft's range and/or endurance, hence selection of the smaller weapon. Usually a pair of SBDs flew together in each search sector, not only to improve chances for a hit on an enemy ship, but to provide mutual navigation and support. Assuming all 18 scouts were launched in pairs, they covered nine search sectors - pie-shaped 'wedges', typically 200 miles on a side with a 20- to 50-mile cross leg. before turning for 'point option', the carrier's expected position upon their return. Obviously, if more than 90 degrees were to be searched, some bombers would also be required. However, from the late summer of 1942, the long-legged TBF Avenger increasingly filled the scouting role, allowing VB aircraft to he retained for strike missions only. The SBD-3 Dauntless was the one which did the most damage to the Imperial Japanese Navy when it really counted during the desperate days of 1942. Reaching front line units during the late spring of 1942, the SBD-3 variant finally brought the Dauntless up to full combat standards. Self-sealing fuel tanks (all in the wings with a capacity of 260 gallons), crew armor, and an armored windscreen were introduced on the SBD-3. This additional equipment brought a further increase in weight and a further reduction in performance. In an attempt to prevent further performance degradation, lighter alclad replaced the dural skinning of earlier variants, and all floatation equipment was removed. The cowl mounted forward firing machine gun that was usually deleted on the SBD-2 was officially reinstated on the SBD-3; full firepower being considered more important than the weight savings. A new model of the Wright Cyclone, the R-1820-52, replaced the similarly powered R-1820-32 engine used on previous models, and the engine ventilation slot aft of the cowling was slightly enlarged with a fixed opening. The net result of these changes was an increase in empty weight, (5525 lbs to 6180 lbs) and a marginal drop in performance; "clean" top speed fell from 256 to 253 mph. During the course of SBD-3 production, a twin .30 caliber flexible machine gun replaced the single .30 caliber flexible machine gun in the radio operator's position. The new twin .30s were covered by a pair of sliding panels which replaced the earlier doors that had covered the single machine gun's stowage trough. The SBD Dauntless was easily the most famous US Navy bomber of WWII, and possibly the most important dive bomber flown by any combatant during the war.